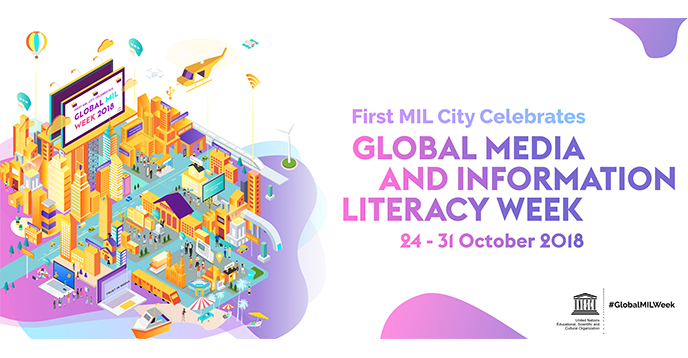 The yearly Global Media and Information Literarcy (MIL) Week, initiated in 2012, is led by UNESCO in cooperation with GAPMIL, UNAOC and the MUIL and Intercultural Dialogue (MILID) University Network. It unites diverse actors committed to promoting MIL as a way to foster social inclusion and intercultural dialogue. The seventh annual global celebration of Media and Information Literacy (MIL) Week is being prepared. The Week will be celebrated from 24 to 31 October 2018, under the theme "Media and Information Literate Cities: Voices, Powers, and Change Makers". Global MIL Week 2018 highlights will include the Eighth MILID Conference and the Youth Agenda Forum, planned to be held in Lithuania and Latvia, from 24 to 25 October 2018 and on 26 October 2018, respectively. In Central Asia, MIL is traditionally supported by universities, libraries and non-governmental organizations. Since 2018, a number of new initiatives and projects have been added to the process, supported by media institutions and the donor community. The topic of media and information literacy was discussed at regional conferences as a tool to combat propaganda and fake news, in the context of the confrontation of xenophobia and the hate speech, as well as MIL gender aspects. Kyrgyzstan presented its practical experience in piloting MIL curriculum in non-formal education at school level. Cities around the world have benefitted hugely from the digital revolution. Information about transportation, health care, entertainment, news, the private sector, civil society, and government has increased efficiency, opened up new economic, social and cultural possibilities, reduced pollution, and enhanced transparency and participation. A growing number of stakeholders are championing “smart cities” initiatives, which seek to make better use of information and communication technology to boost efficiency and quality of life in respect to security, health, recreation, community services, and government to citizens interaction and vice versa. 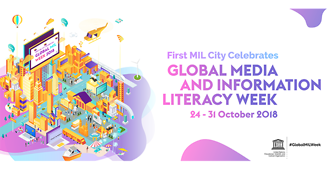 Global MIL Week 2018 will highlight that smart, sustainable cities must also be media and information literate cities (MIL Cities). MIL Cities put people at their heart by helping everyone, through creative means, throughout their lifetimes, develop the competencies required to make the most of media, information, and technology. They enable citizens to make better use of the practical possibilities a connected city can provide, and engage more creatively, critically and effectively in it. Such actions advance the achievement of SDG 11, Make cities inclusive, safe, resilient and sustainable; SDG 4, Ensure inclusive and equitable quality education and promote lifelong learning opportunities for all; SDG 5, Enhance the use of enabling technology, in particular information and communications technology, to promote the empowerment of women; and SDG 16, Promote peaceful and inclusive societies for sustainable development, provide access to justice for all and build effective, accountable and inclusive institutions at all levels.